I believe I just wrote a review. I keep getting these. It's been a while since I chewed gum and love these. Mint and chocolate are favourites of mine. The fact that they are so free from things we do not need is the best thing. Xylitol was recommended by my dentist a while back. Glad t find where I can get it easily. Of all the flavours, the chocolate mint retains its flavour and softness the longest. The older kids like this gum but the younger ones find it too strong. The chocolate flavour disappears after a while but the mint stays very strong for a very long time. Yum! Gum I feel good about giving to my kids! My mint-hating son doesn't mind this flavour as it's very mild. Definitely tastes like chocolate mint, but mixed reviews from my family on whether that is good or not. Overall a good product, but personally i like the spearmint flavour better. Great gum, good amount for the price! My kids love this gum and I like that it does not contain aspartame. Love the flavor! No aspartame makes it a smart choice. My daughter loves this gum also! I love that this gum is aspartame free and sugar free. Tastes yummy too. The mint and chocolate flavor is a nice combination. Flavor doesn't last long though. A gum with no harmful ingredients and that tastes great! In the line, this flavour is by far my favourite. This is my favorite flavour in the Pur gum line! It's really a nice choc/mint and the flavour lasts a good long time. The gum is made in Canada and I like to support Canadian products. Xylitol is a healthy substitute for sugar and aspartame. Finally! A gum that has no aspartame! I love this gum, nice chocolate flavor at first then peppermint after. So good. As good as the other Pur gums and flavour is a nice balance between chocolate and mint. However flavour disappears too fast, which is a minus. I take two or thee gums one after the other to keep flavour lasting a little longer. I love the Pur Chocolate Mint flavour! A nice chocolate flavour with a hint of mint. This is my new favourite flavour! 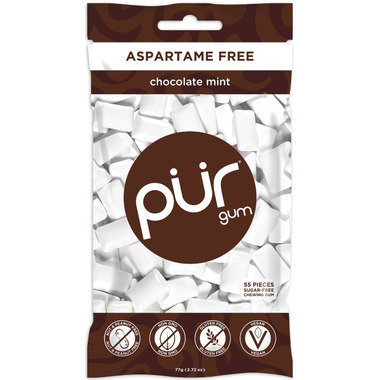 The bonus is that Pur gum is free of harmful ingredients (such as aspartame) and free from several food allergens (gluten, dairy, etc). I chew this stuff to help with my chronic dry mouth. The chocolate mint flavour is subtle and delicious! This flavour is a favourite at our house. My kids love it. My son liked the new flavour, good price too. I love how natural Pur is but I've found their other gums too strong with mint. This chocolate one is one of my favourites. The mint doesn't overpower your mouth. The chocolate is sweet but doesn't linger which his great. The gum is long eating but the tasted dissipates which is fine by me. No aftertaste either. I was very excited to try this gum because I love Pur but I don't like really minty gums, so I thought this would be perfect for me because it's chocolate mint and I love mint chocolate ice-cream. Unfortunately, I was disappointed in this gum. I don't know quite how to describe it, but it didn't taste like mint chocolate. It had a very odd flavour that I didn't like. However, if you like minty gums then you'll probably like this. Nice mild sweet unique gum flavour with no aspartame. Would be great as a mint too! I think this is my new gum.